A number of revealing set photos from The Dark Knight Rises have been pouring onto the web throughout the weekend, giving Batman fans a sneak peak into Christopher Nolan's closely guarded film. Last night, we shared a first look at Tom Hardy as Bane in his military-inspired full costume, along with a couple snapshots of the powerful villain standing atop what appears to be his very own version of the Tumbler. Today, we have even more goodies from the set of the film, including a glimpse at Batman and Bane standing side-by-side. The first image, from fan Matt Maranowski (via Latino Review), shows Christian Bale and Tom Hardy between takes standing around the set. Interestingly, the pair don't seem all that far apart in size. Does this mean that Bane isn't going to be the massive hulking beast we all expect (at least not from the get-go)? Of course not. 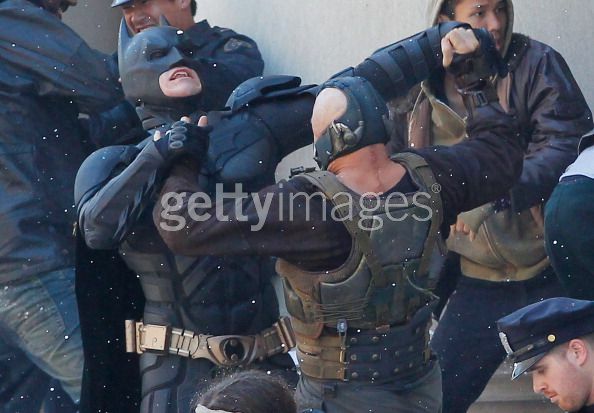 Check out Latino Review or these Getty Images (Here & Here) for a few added images of Batman and Bane duking it out. More on why Bane will still be a big brawler after the image. In looking at this picture, there are a couple of things to discuss. First off, Bane and Batman look like they're roughly the same height and body type. Obviously, that's a big change from the comics, where Bane is so overwhelmingly large that he's able to snap Batman like a toothpick over his knee. Before everyone pulls out their fanboy pitchforks though, let's remember that this doesn't reflect what the characters will look like on the big screen. There are tons of camera tricks to make one actor look big and another actor look small, and it's not like Christopher Nolan is an amateur, so I'm sure that the size issue won't come into play. More to the point, Bane seems to be in his regular costume here. As noted in the Dark Knight Rises teaser trailer, when Bane is hulking toward Batman, he's showing off a lot more muscle. My guess is that these photos represent Bane when he isn't on the super-steroid Venom. Presumably, he will inject the steroid (or inhale it), when he really needs to put a hurt on the Caped Crusader. But wait, that's not all. 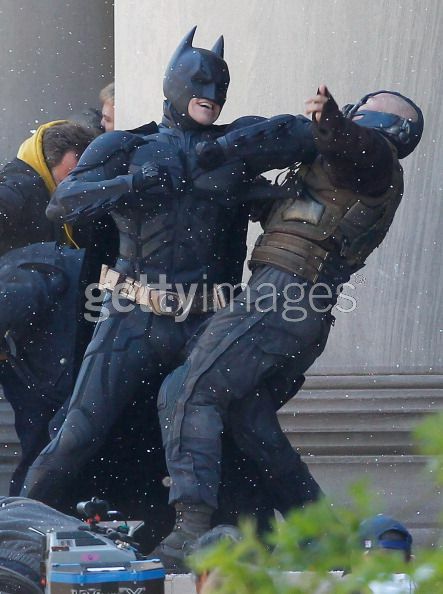 We also have another picture from the set of The Dark Knight Rises, and this one definitely confirms an earlier story SPOILER. Seriously, this image (from the SuperHeroHype forums) could spoil a big action scene plot-line in the movie, so if you're at all sensitive about these things, look away! Consider yourself warned the following could be considered major Dark Knight Rises spoilers! Can anyone say Knightfall? As we've discussed previously here at Screen Rant, the Knightfall saga is one of the most critical stories in Batman history. The series begins with the mysterious Bane breaking out every super-criminal from Arkham Asylum. As Batman subsequently tries to recapture them all one-by-one, he breaks down both mentally and physically. By the time he faces off against Bane, Batman is so weak that he's easily defeated, leading to Bane literally breaking him in half. If I'm reading these images right, it seems like Nolan and company may be using a similar set-up to introduce Bane in The Dark Knight Rises. If Bane breaks a bunch of criminals free at the beginning of the film, it would send Gotham into a panic and force Batman to come out of hiding (where he's been since the end of The Dark Knight). Could this scene be the first big action set-piece of the film? UPDATE: A reader over at Comic Book Movie snagged a video from The Dark Knight Rises set, which features a sequence of what looks like armed mercenaries escorting "a lady wearing a brown jacket and dark khakis," out of Gotham City Hall. The mercenary and their lady all climb into...a camouflage tumbler and drive off. Now, the speculation is that this is a scene of Marion Cotillard's character, "Miranda Tate," who we (and a lot of others) have long speculated will be revealed as Ra's al Ghul's daughter, Talia - thereby tying this third and final chapter directly to Batman Begins. While the footage is from a distance, a closer look at some still images of Cotillard in costume confirm it is in fact her emerging from Gotham City Hall and hopping in that tumbler. Finally, for a look at not one, but TWO tumbler vehicles used on The Dark Knight Rises set, go HERE. 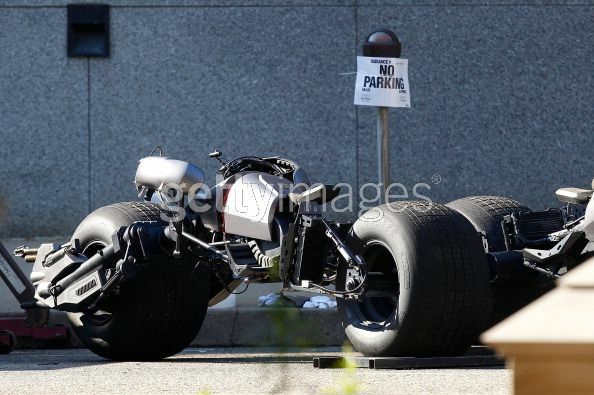 For a look at an all-too-familiar Batpod, go HERE. What do you think? Are Nolan and company going to take a page from the Knightfall saga? If so, is it also possible that Bane will break the Batman's back? BONUS: Even late night TV shows are airing video from the Dark Knight Rises set! The Dark Knight Rises hits theaters a little less than a year from now on July 20, 2012.